LDUK were presented with a cheque for £1081.25 from Lincoln firm, Witham Oil and Paint. Managing Director Nigel and Marketing Director Ali presented the cheque to our Press Manager Julia Knight. Nigel and Ali are personal friends Karen Everatt whose daughter Abigail is very ill with Lyme disease. 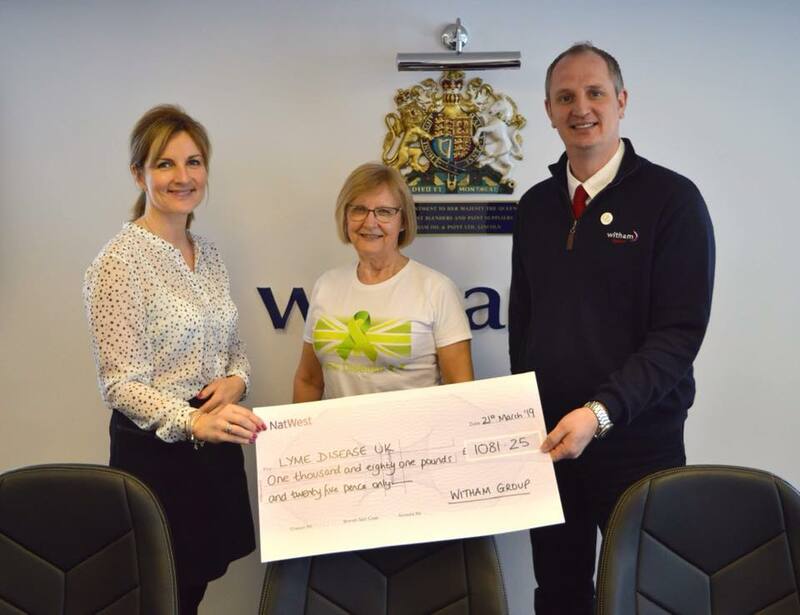 Each year Witham Oil and Paint holds a charity ball to raise money for causes close to their hearts and in support of Abigail they chose LDUK as one of their charities this year. A huge milestone for LDUK to receive this wonderful donation so quickly after obtaining charity status. 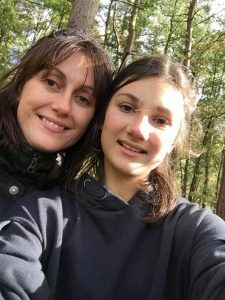 Abigail fell ill with a flu-like virus in November 2017 a week after returning from a short break in the Peak District walking through woodlands and fields. Karen, Abigail’s mum says previous to this, Abigail had no health issues, had a good diet, exercised & was a happy normal 11-year-old who had just started secondary school. She was very unwell for a week then experienced some improvement and went back to school. She struggled for 10 days then had to stop school and has not been able to attend again since then. Her symptoms included insomnia, head pain, sore throat, stomach tenderness and cramps, muscle/joint pain and weakness, light, sound and touch sensitivity. NHS doctors diagnosed post viral fatigue, then CFS/ME and advised Graded Exercise Therapy and Cognitive Behavioural Therapy which she was not able to do as she was too unwell. Instead of helping, they caused her symptoms to flare. Karen sought out a chiropractor and he advised a nutritionist that he knew and she suggested Lyme disease, which was already on Karen’s radar after she joined Facebook groups for parents of children with ME/CFS and then the Lyme Disease UK Online Community. Abigail had private blood tests sent to Germany which came back positive for Lyme and other co-infections. Abigail is now been treated privately in Dublin with antibiotics plus herbs and supplements since August 18 and in the last month has started to show small signs of improving. Her sensitivity is decreasing, she is talking more and has started a small amount of reading each night. She has been unable to read for 15 months. Our heartfelt thanks go to Karen, Abigail and all at Witham Oil and Paint for this very generous donation and we wish Abigail all the best with her recovery. « What’s The Best Thing Someone Has Done For You Whilst Having Lyme?